In this model, campaign configuration occurs in Sitecore. Google Analytics is simply a downstream recipient of that information once a user reaches the website. This is all made possible with minimal developer effort thanks to Google Tag Manager. You may have used Sitecore’s campaign functionality if your organization uses Engagement Value in order to measure campaign performance. Even if you’re not using Engagement Value, there are benefits to this approach in terms of campaign tagging consistency. To create a campaign in Sitecore, navigate to the Marketing Control Panel, select the Campaigns node and create a new campaign. Once your campaign has been created, select a channel and give it a title. These fields will eventually map to Google Analytics campaign, source, and medium information as described in step 3. While explaining the benefits of a data layer is outside the scope of this blog post, there are several resources available for developers and non-developers alike. The first 2 parameters are pulled directly from the campaign item itself. However, the 3rd parameter requires additional code. 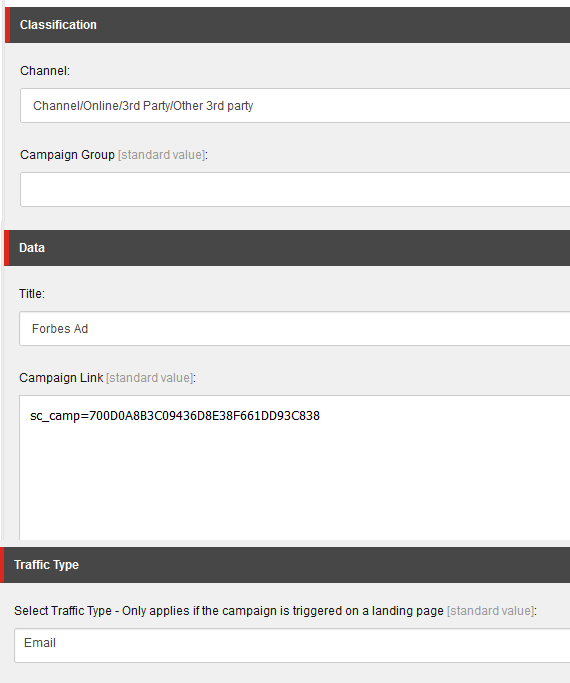 If the “Traffic Type” parameter within the campaign is filled out we want to use that. However, if it’s left blank we want to use whatever traffic type Sitecore has determined at the time the user reaches the website. This is useful if you’re using campaign links that may be used across multiple traffic types. Because we pushed the campaign information to the data layer in the previous step, we can complete this last step without developer involvement using Google Tag Manager. The benefits of Google Tag Manager are outside the scope of this blog post, but there are several great resources online for both developers and non-developers. In this step, we’ll configure Tag Manager to include the information we placed in the data layer in the page view hit data that’s sent to Google Analytics on page load. Next, we need to update our page view tag to send this information to Google Analytics. This information can be found under the “More Settings > Fields to Set” options when configuring your tag. Once you save and publish your tag, you’ll begin to see Sitecore campaign data flowing into Google Analytics. Keep in mind that campaign information from AdWords will overwrite these settings if you have auto-tagging enabled (which is usually ideal). There is a great flow chart here showing exactly how Google Analytics determines a user’s source, medium, and campaign. Hopefully this can help your organization simplify the campaign tagging process while making your campaign data more consistent. Please feel free to reach out with questions or comments. This is incredibly helpful. Thanks for the detailed code sample. Would the code to do the datalayer push need to be present on all sitecore pages for this to work? This is a very interesting idea and I definitely see a lot of benefit in this. My question is around your step 2. I understand the datalayer and all of that. I’m trying to figure out, is the intention that once the campaign is created the user would assign the campaign to content items (pages if you will) and then you expose the info to the datalayer on that page OR is the intention you can use the campaign code on any page? And in which case then how are you getting the datalayer exposed on the page? Basically I’m tring to figure out where the code goes. So you wouldn’t tag the Sitecore pages with Sitecore campaigns, you would append links to your domain with the Sitecore campaign code. Thanks Adam. That makes sense. So then where are you putting the code that pushes the UTM to the datalayer then? So the code you have in step 2, where does that go? Oh sorry, I misunderstood your question. If you’re talking about the Sitecore C# code, I’m not exactly clear on where it would go but you would want it executing on every page of the website. I only handled the GTM portion of this implementation, not the Sitecore coding. What is itemValue()? Is this a custom function? What does it do? Tracker.Current.Interaction.TrafficType always returns a 0 (Unknown) which I suppose is correct in my case. But I have set my campaign to be something else, so I need to get the type from the Campaign. I hope this makes sense and you can help. Thanks in advance.